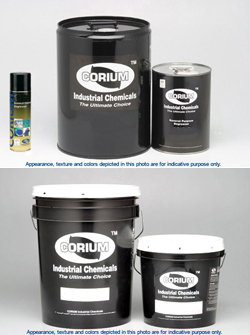 Corium Industrial Chemicals is a division of Magna Industrial Co. Limited. Highest quality chemical products for MAXIMUM EFFECTIVENESS and INCREASED OPERATING EFFICIENCY. Each formula custom-tailored to specific applications for INCREASED PARTS and EQUIPMENT LIFE. Corium’s concentrated high-performance chemical products are safe and easy to use… to help ELIMINATE DOWNTIME and CUT MAINTNANCE COSTS. In the new millennium, ADVANCES IN TECHNOLOGY and PRODUCTION METHODS will come even FASTER. Tougher competition in your market means EVER-RISING DEMANDS. Now more than ever you need NEW SOLUTIONS to new problems. You need QUALITY PRODUCTS you can rely on. You need a PROVEN BRAND you can trust to keep you running at PEAK PRODUCTION. Now More Than Ever – You Need Corium ! Scale Remover A highly efficient material designed for the safe removal of rust, scales and the associated streaks, stains and spots caused by rust. Solvent for Drains A highly-activated industrial solvent that rapidly dissolves and disintegrates stoppages in pipes and drains. Treatment Concentrate A newly-developed effective combination of corrosion and scale inhibiting compounds for the treatment of recirculating water system. Equipment Cleaner A super non-acidic cleaner made with advanced and automatic cleaning compounds. It enhances the overall efficiency of ovens, grills, deep fat fryers, rotisseries and ranges by providing a powerful & complete cleaning solution. bright coating The new CORIUM 78 Gleaming Zinc Coating Spray is formulated with a proprietary package of zinc, & other light metal powders, synthetic resins and a family of additives. Cleaner A powerful food grade cleaner specially designed to help professional cleaners, hotels, caterers, restaurant operators, food & beverage processing plants and commercial kitchens to perform the highest quality cleaning jobs in the safest ways. Masonry and Brick All purpose cleaner for brick and masonry. Quickly and efficiently remove mortar residue, wood and rust stains. Cleaner Concentrate Biodegradable, germicidal disinfectant for cleaning with an effective four-way action. It cleans as it disinfects while it softens water and deodorizes. CORIUM Z 123 General Purpose Degreaser The new environmental-friendly, multipurpose degreaser formulated with high-purity solvency and fast evaporation properties. CORIUM Z 168 Electrical & Motor Cleaner The new environment-friendly, precision degreaser formulated for electrical contacts and motors. It offers high solvency and fast evaporation properties. CORIUM Z 603 "Back-To-Spec" Electronics Cleaner Engineered to be an easy-to-use and highly-effective cleaner for all types of electrical/electronic components and parts. Highly recommended for cleaning, degreasing or flushing away oxides, burnt-on carbon, varnishing build-up and oil contaminants. Non-flammable. Repair Compound Contains metallic additives that provides a fully machinable compound, especially adapted for filling cracks, building up metals, and all heavy duty and repair situations requiring rebuilding and machining operations. Sealing & Filling Compound Handy to use, provides reliable results effortlessly and can be used on parts made of steel, copper, aluminum, cast iron, stainless, galvanized, brass and chrome. It will even seal and repair cracks on hard surfaces like porcelain, enamelware, glass and ceramics. CORIUM Z 10 R-R Liquid Rust Remover & Passivator A fully concentrated, liquid rust remover and oxidation inhibitor designed to replace, dangerous muriatic, sulphuric and hydrochloric acids. CORIUM Z 76 Super Powdered Descaler Super effective an safe replacement for dangerous muriatic acid. Comes super concentrated with 100% active ingredients. Safe to handle, transport and store without special precautions - unlike volatile acids. CORIUM Z 79 "Rust Guard" Metal Protector Forms a golden brown transparent protective coating that effectively seals out rust and all forms of corrosion on all types of metal surfaces - machined, smooth or rough. CORIUM Z 80 Advanced Boiler Treatment Compound Offers the convenience of handling only one material to control the many problems associated with the operation of low to medium pressure boilers. CORIUM Z 86 "Safety-Plus" Industrial Cleaner Concentrate A research-developed product designed for use in industrial, manufacturing and food processing plants. Completely non-flammable and can be used around high temperature machines and blowers. Also available in "Clear" formulation as Corium Z86C. CORIUM Z 91 "Supra-Ease" Stainless Steel Passivator Features an extremely easy system for rejuvenating stainless steel. Super Cleaning properties. Improves solution. Use for heavy-duty degreasing of engine blocks, machinery and equipment. CORIUM Z 97 "Big Blue" Concentrated Multi-Purpose Cleaner A highly effective chemical compound consists of special additives that transform ordinary water into an effective cleaning solution. It is suitable for engines, machinery and other heavy equipment. Easily remove heavy grease. CORIUM Z 102 Superior Paint, Ink & Varnish Remover Penetrates into the existing ink, paint, lacquer, phenolic finishes or varnish coating and quickly destroys the molecular attraction between the ink and base materials. CORIUM Z 105 Battery Cleaner & Terminal Conditioner Super effective way to rapidly clean all lead acid batteries without hard labour and mixing dangerous chemicals. CORIUM Z 107 Battery Cable & Terminal Protector Forms a corrosion and moisture-proof protection coating that holds power longer. Cuts battery maintenance costs drastically. CORIUM Z 127 "Bolt-Ease" Advanced Penetrating Oil A special maintenance-formulated product designed to ease the arduous problems of seizure, corrosion and rust-frozen components so common in maintenance. Can actually dissolves the rust chemically. Also available in bulk as Corium Z1270. CORIUM Z 128 Multi-Purpose Anti-Seize Compound A thread lubricant and supreme multi-purpose anti-seize maintenance formula containing a sophisticated blend of finely ground metals with anti-seize properties. CORIUM Z 157 Moly Dry Lubricant A new dry lubricant based on molybdenum disulphide (MoS2). Able to withstand temperature up to 1112°F (600°C). CORIUM Z 161 "Double Action" Power Belt Dressing A fast, easy and clean method of protecting and prolonging the service life of all types of power transmission belts. CORIUM Z 187 Super Gasket Remover Features high-energy ingredients that quickly and economically remove old or damaged gasketting compopunds and materials from machinery surfaces. Ensures maximum "sealability" when a new gasket is to be used. CORIUM Z 190 Superior Gasketting Compound Engineered to replace fully 98% of conventional, old-fashioned gasketting materials that offer limited life and performance. Can be used on virtually all types of flanges, cover plates, hose connections and threaded assemblies. CORIUM Z 191 Super Hi-Temp Silicone Sealant is formulated with RTV (Room Temperature Vulcanizing) silicone that is free from corrosive acid and unpleasant odor. CORIUM Z 199 Super Silicone Lubricant A super silicone designed to lubricate and preserve any material against heat, cold, moisture, weathering and corrosion. Ideal for rapid lubrication. CORIUM Z 202 High Dielectric Red Insulating Varnish A fast, tough, durable method of insulating electrical devices of all types. Protects against dangerous Corona discharge, arcing and high voltage leaks. Positively will not crack under vibration. CORIUM Z 211 Moisture Suppressant for Electrical Fittings Evaporates water on plugs, points and other delicate automotive parts. Instantly forms moisture barrier. CORIUM Z 253 Spray-On Gear & Wire Lubricant Penetrates into the pores of metal and wire rope to provide unparalleled lubrication. Protects treated parts from corrosion, both in use and in storage.